Vesicoureteral reflux (VUR) occurs when urine from the bladder backs up into the ureters and kidneys. Normally, urine is produced in the kidneys and travels through tubes, called ureters, that are attached to the bladder. VUR is a serious issue that, left untreated, can cause permanent kidney damage. The causes of vesicoureteral reflux can be primary or secondary. Primary VUR is present at birth, is typically one-sided (unilateral)--affecting just one kidney and ureter--and occurs when one of the ureters doesn't grow to a proper length in utero. When this happens, the valve at the junction of the ureter and the bladder can be dysfunctional and causes urine to back up into the ureter and potentially the kidneys. Secondary VUR occurs when a previously healthy flow somehow gets blocked. It occurs in children and adults and can result from anatomical or functional causes. In most instances, secondary VUR affects both ureters and kidneys (bilateral). Anatomical: Anatomical causes of VUR include changes in the structure or function of the bladder and/or ureters due to surgery or injury. Functional: Functional causes of vesicoureteral reflux include diseases that impact bladder function. For example, urinary tract infections (UTIs) can cause swelling in the bladder and ureters, blocking flow and allowing urine to back up into the kidneys. In men, an enlarged prostate can place pressure on the bladder, pushing urine from the bladder backwards into the ureters and kidneys. Ultrasound - Ultrasounds use sound waves to view organs and soft tissues inside the body and help a doctor determine if there are any structural abnormalities in the urinary system. 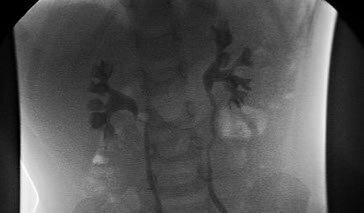 Voiding cystourethrogram (VCUG) - This test uses X-rays in combination with contrast dye (injected via a catheter in the bladder) to view the bladder and ureters. X-rays are taken before and after urination to visualize bladder function and determine how well the bladder and ureters are functioning. Radionuclide cystogram (RNC) - This test is similar to the VCUG, except that a radioactive tracer is injected into the bladder to monitor urine flow. The RNC is more sensitive than the VCUG and may provide better imaging to diagnose less severe cases of vesicoureteral reflux. Treatment of vesicoureteral reflux depends on the severity of the condition. The goal of treatment is to prevent permanent damage to the kidneys, and can range from a watch-and-wait approach to surgery.